During Thanksgiving, our minds stay focused on big food decisions: deep fried vs baked turkey or vegetables soaked in toasted marshmallows or garlic butter? We tell ourselves, “It’s just one day and then I’ll hit the gym.” That’s all fine until bloating starts. Thankfully, there are few tips to help avoid discomfort after a big, delicious meal. I would recommend sectioning off your first plate of food carefully. Eating more protein is not only tasty but can also help you feel fuller and avoid eating extra mac and cheese or corn bread. But don’t forget to hydrate with water throughout the meal. Water tends to make us feel fuller and dilutes all the salt we eat from big holiday meals, which are no doubt delicious because they are so well seasoned! Don’t forget to exercise on the days leading up to Thursday and the ones following. One heavy meal isn’t going to add too much extra weight if you keep up with your regular exercise routine. Also, if you’re part of the prep in any way, opt for healthier ingredients. For example, making cranberry sauce with fresh cranberries prevents consumption of all the extra additives and sugars from canned cranberries. Another idea is making a bulk of your own salad dressing with lemon, olive oil and seasonings instead of bottled dressings that tend to be higher in calories and sugars. 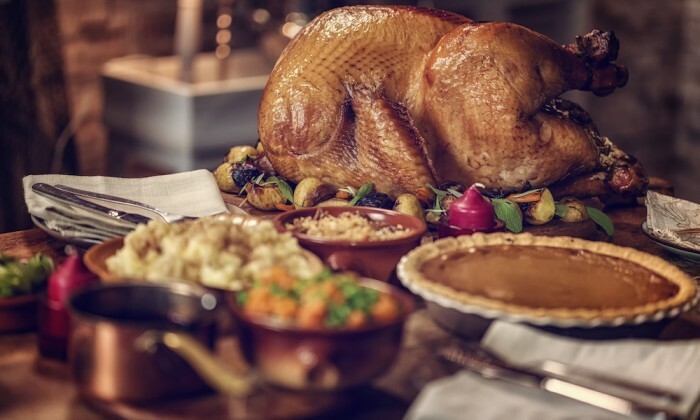 There has also been speculation that eating too much turkey induces drowsiness because it’s high in tryptophan, an amino acid essential for protein synthesis. But other meats like poultry and pork also contain tryptophan. So why would eating a lot of turkey make someone feel sleepy? Eating a large amount of any food will cause drowsiness as a result of the large amounts of carbohydrates consumed. The process of digesting carbohydrates with a high glycemic index, or a lot of sugar, can contribute to somnolence. The effect of alcohol consumption can also add to an overall sedative effect after a large meal. Simply be conscious of what’s on your plate and there won’t be any falling asleep early this Thanksgiving.